Holiday Gifts: let’s talk about another way to do this. This holiday season is a little different for us. My kids are 12 and 17, definitely old enough to understand the conversation we had at dinner last night, wherein I outlined how our gift plans will be different this year. How as a family we’re going to focus on giving gifts instead of receiving them. Because our basic needs are met, we can help other families enjoy the same peace of mind. So while we ate dinner, we passed around a Heifer International catalog and looked at the different animals we could buy for a struggling family in a developing nation. Did you know you can buy a goat for a family for $120? That’s less than any one of the Lego sets my son has eye on. Did you also know that when you buy a goat for a family, they can get several quarts of nutrient packed milk a day to feed their family? And that the leftovers can be made into cheese or yogurt, or sold at market? That’s pretty amazing. 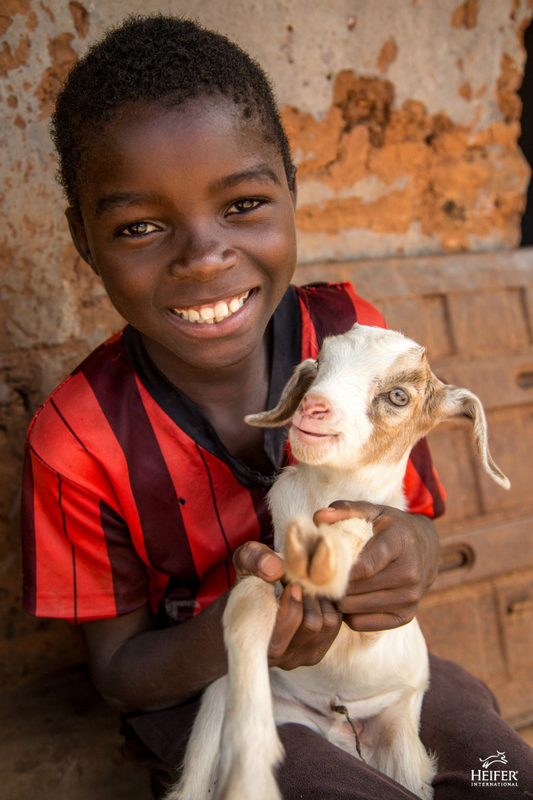 The gift of an animal, like a goat, serves as both daily food and sustainable income, and as this happens entire communities can create agricultural cooperatives, form community savings, and fund small businesses. All from one animal at a time, like a goat, for $120. 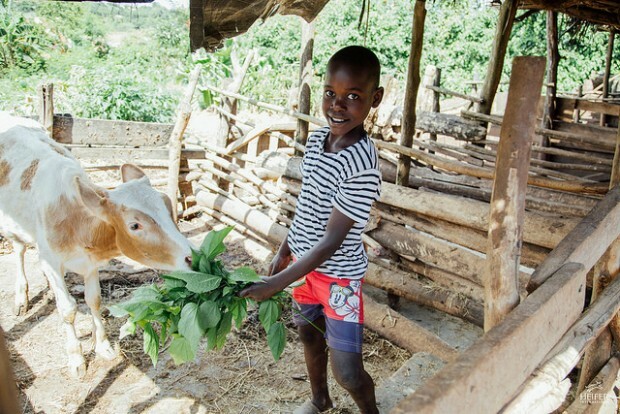 The goal of every Heifer project is to help families achieve self-reliance, and Heifer does this by providing people the tools they need to sustain themselves. Instead of just giving a one time donation, the whole idea is that a gift is given which creates a better life for one family, and then another, which creates a better community, which creates a better world. The gift of an animal is just the beginning. By the way, if you don’t have $120, you can buy shares of an animal. You can buy a share of a goat, pig, sheep, or trio of rabbits for $10. If you have $10 to give, this is a great way to spend the cash. And if you don’t have $10, skip two trips to Starbucks and reroute the money to Heifer International instead. It’s super easy, affordable, and totally worth it. As we passed the catalog around the dinner table last night, we talked about which animals the kids the kids would most love to donate. We settled on a hive of honeybees ($30) and a flock of chicks ($20). Then I asked the kids if money were no limit, what they’d love to buy from the Heifer catalog. They were unanimous: the Gift Ark. For $5,000 you can buy: 2 cows, 2 sheep, 2 oxen, 2 water buffalo, 2 pigs, 2 beehives, 2 goats, 2 donkeys, 2 trios of ducks, 2 trios of rabbits, 2 trios of guinea pigs, 2 flocks of geese, 2 flocks of chicks, 2 llamas, and 2 schools of fish. Maybe someday we’ll be able to afford the Gift Ark (how cool would that be?) but in the meantime we can definitely afford some bees and chicks, especially if they replace a few Christmas gifts for my children. My favorite part of the model for Heifer International is Passing on the Gift. This means families share the training they receive, and pass on the first female offspring of their livestock to another family. This extends the impact of the original gift, allowing a once impoverished family to become donors and full participants in improving their communities. By 2020, Heifer aims to help 4 million families achieve living incomes. FOUR MILLION FAMILIES. This income will allow them to send their children to school, feed themselves adequately across every month of the year; and have proper housing, water, hygiene and other essential resources. Everything about this organization is amazing. 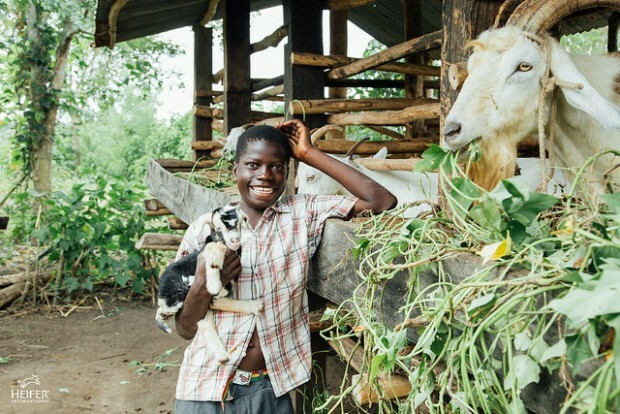 I really encourage you to visit Heifer.org to learn more about how you can get involved, or do what we did and sit down with your kids and the Heifer online gift catalog and pick out an animal or two to buy. I promise your kids are capable of enjoying this kind of gift giving if you bring them in on the deal all along the way. Mine are genuinely excited about it.